General Motors wasted no time in announcing its plans to bring a compact turbodiesel to the GMC Canyon and Chevrolet Colorado midsize pickups. In fact, the all three engine options were announced back in 2014 ahead of the 2015 model year launch. 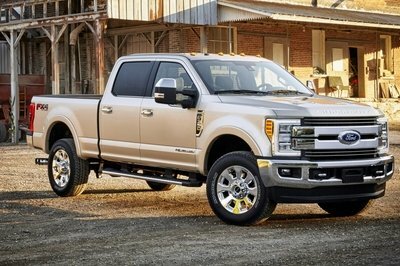 Sadly we had to wait until the 2016 model year before the 2.8-liter Duramax four-cylinder turbodiesel became available. Well, the wait is finally over and we’re gotten out chance behind the wheel. The Duramax is slotted as the Canyon’s range-topping engine. And while it does carry a $3,730 premium over the 3.6-liter gasoline V-6, the turbodiesel offers impressive fuel economy, outstanding towing abilities, and surprising everyday livability. To say it’s a well-rounded engine is an understatement. Of course, there’s more to the Canyon than just its powerplant. The large chrome grille, LED-encrusted headlights, utility-minded cargo bed, helpful step bumpers, and overall handsome looks are still present, though everything is carried over from 2015. The truck still looks fresh in its second year, and should continue looking so for several more years. Inside, the Canyon’s cabin is a leather-lined paradise for hard-working folks. It’s also a usable space for the average family, too. The rear bench fits two comfortably, three in a pinch, and folds in two different directions to accommodate different cargo. 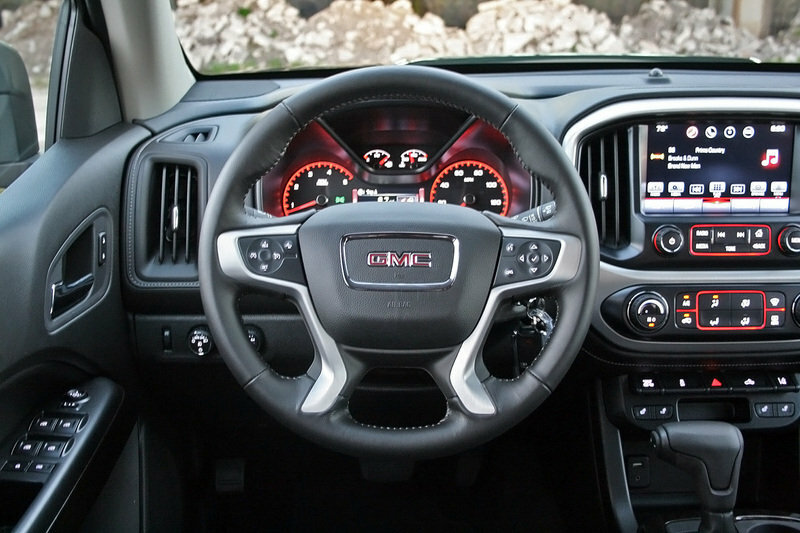 GMC’s IntelliLink infotainment system software ranks high in user friendliness, while the gauge cluster looks somewhat dull. Nevertheless, the Canyon is a very strong competitor in its class. Let’s have a look. 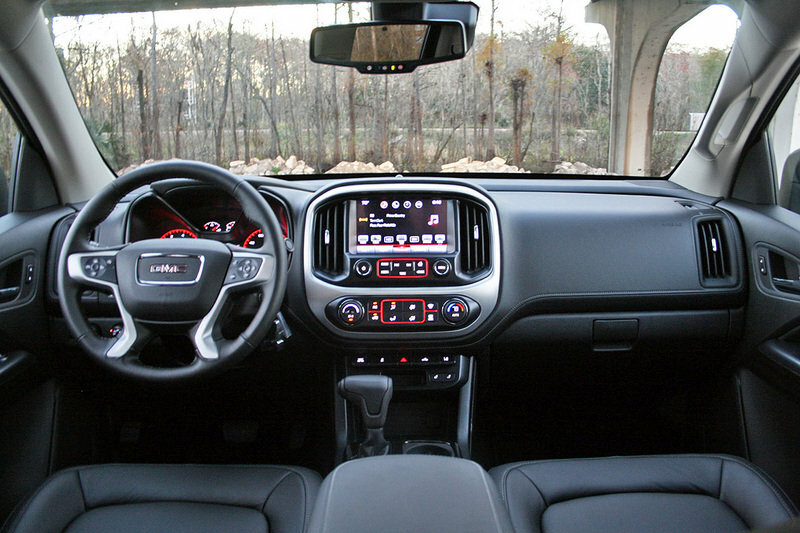 The 2016 GMC Canyon is a handsome truck. 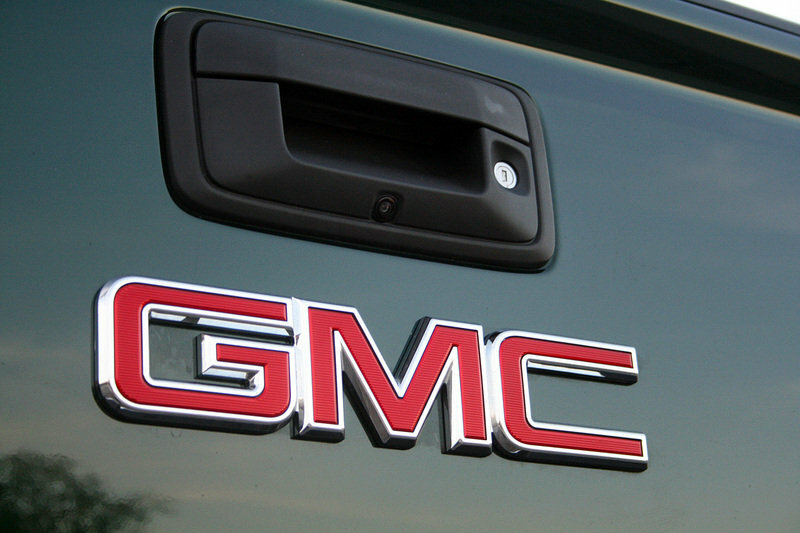 The chrome grille is upright and proud, showing off its red GMC badge. Chrome accents continue all over the truck, including the bumpers, mirror caps, door handles, window bezels, and wheels. I particularly love the Emerald Green Metallic paint my tester wore. The projector beam headlights are surrounded by LED accents used as daytime running lights. Fog lights in the bumper further help illuminate the road ahead. Down low, tow hooks provide an extra level of utility should someone need saving from sand or snow bank. Overall, the Canyon is a great looking truck with an eye on details. Its strong shoulders complement the Canyon’s tall front. The squared-off wheel wells and fender flairs help give the truck visual interest. A sculpted bodyline runs along the bottom of the doors, helping reduce the truck’s visual weight. Out back, the bright chrome work continues. The bumper, badging, and taillights all contrast the dark green paint. The clear lenses of the taillights allow the detail work within the taillight to shine through. 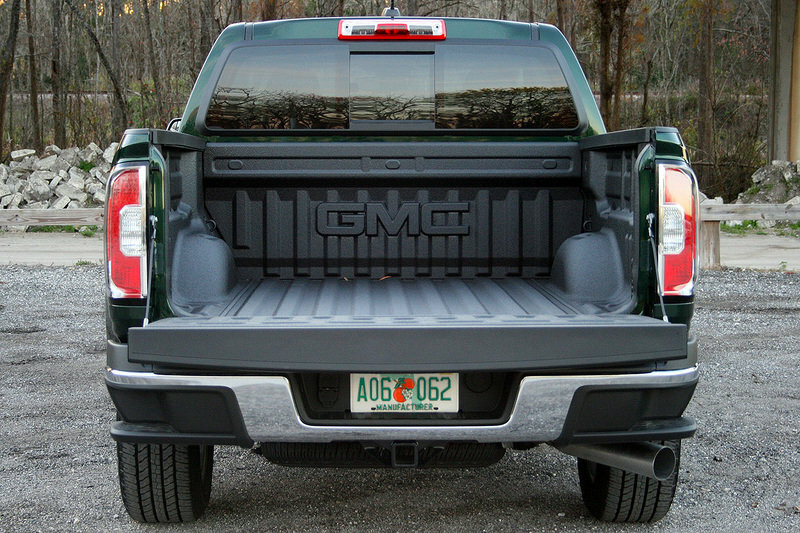 The lockable tailgate comes equipped with GM’s EZ lift and lower system, making one-handed operation a breeze. The bumper also incorporated both four- and seven-pin connectors for trailer wiring, The standard two-inch receiver hitch mounts to the frame and allows the Canyon Duramax to tow 7,700 pounds, or in the case of 4WD versions, 7,600 pounds. Beyond the tow hooks and reviver hitch, this 4WD tester came fitted with underbody skid plates. All three combined gives the truck the ability to head off-road without worry of getting irrevocably stuck or damaged from debris. There are a few nit-picky items I have to call out. First is the low-hanging air dam. I get it, it increases highway fuel economy; great. Now just make it easily removable. Unfortunately, the air dam is bolted on from the top down, making the fasteners impossible to remove without first removing the entire bumper. I’ve previously spoken with GM about the issue and was told the fasteners would soon be screwed in from underneath, making removal of the air dam a simple job. Yet here in 2016, the supposed “early-production flaw” has not been corrected. Secondly, tailgate locks, but not with the key fob. You’ve got to manually lock it with the key. This isn’t a big deal unless you’re using a tonneau cover to secure valuable cargo in the bed. Overall, the Canyon is a great looking truck with an eye on details. Like the exterior, the Canyon’s interior didn’t change for the 2016 model year. It still utilizes the same designs and materials as before, along with the same infotainment software. Starting from behind the wheel, the driver is greeted with a fairly plane and nondescript gauge cluster. The center stack offers more visual interest, especially with the toggle switches that operate options like Tow/Haul mode and Lane Departure Warning. The center console is simple enough, offering the gearshift, two cup holders, and two small coin trays for odds and ends. The front seats offer good support, though the seat bottoms are somewhat short. Rear seat comfort is good, though it’s no luxury sedan. 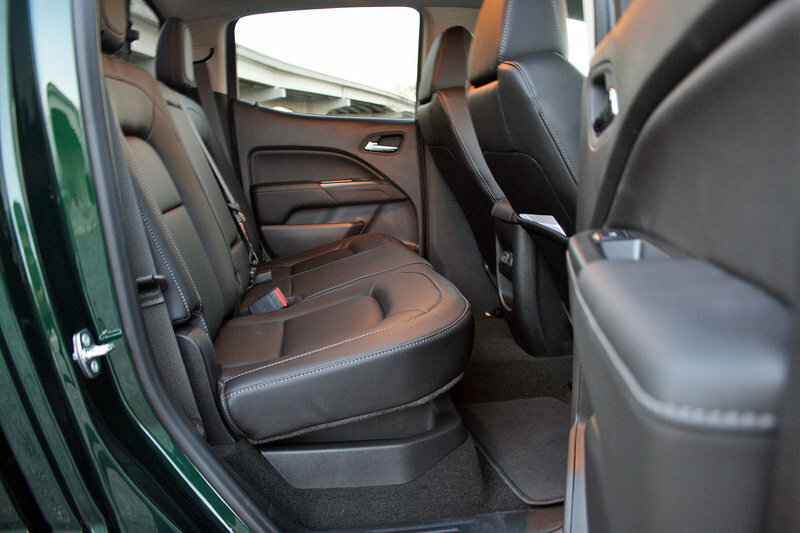 The front seats offer simple four-way power adjustments, while the rear bench is stationary. It does, however, fold for cargo storage. Pulling up on the seat bottom allows for access to a storage compartment and tire changing equipment. Folding the seatbacks forward offers a flat storage shelf, though vertical height is limited. Ergonomics wise, the Canyon scores well. The driver enjoys well-placed controls that are easy to use. The eight-inch touch screen and its IntelliLink software is fantastic to use, being simple to figure out, graphically interesting, and relatively quick to respond. The software also includes Apple CarPlay and Android Auto, along with the built-in 4G LTE Wi-Fi hotspot. A rear back-up camera with dynamic direction lines comes standard at this trim. Outward visibility is good thanks to large windows and decent side mirrors. Blind Spot Monitoring and Lane Departure warning help keep accidents from happening. Rear visibility is somewhat limited, though no more than most of today’s crossovers. Downsides to the interior are few, but notable. First, the gear shifter’s release button will pinch unsuspecting fingers if not careful. I’ve written about this before, having given myself a nasty welt. The button pivots rearward into the shifter and can sometimes sandwich skin between itself and the shift knob. I’ve simply learned how not to grab the shifter. Second is the gauge cluster. As I mention in the video review, the cluster looks dull and free of imagination and design taste. This might work in a Chevy Aveo, but not a $44,000 pickup. What’s more, the speedometer counts by intervals of 20 mph, making it hard to read at a glance and leaving the second half of the gauge unused. The Canyon’s governed speed limit is only 99 mph. Why then is there wasted space counting to 160 mph? Nevertheless, the interior is a great place to spend time. It’s comfortable, easy to use, and mostly worthy of its price tag. 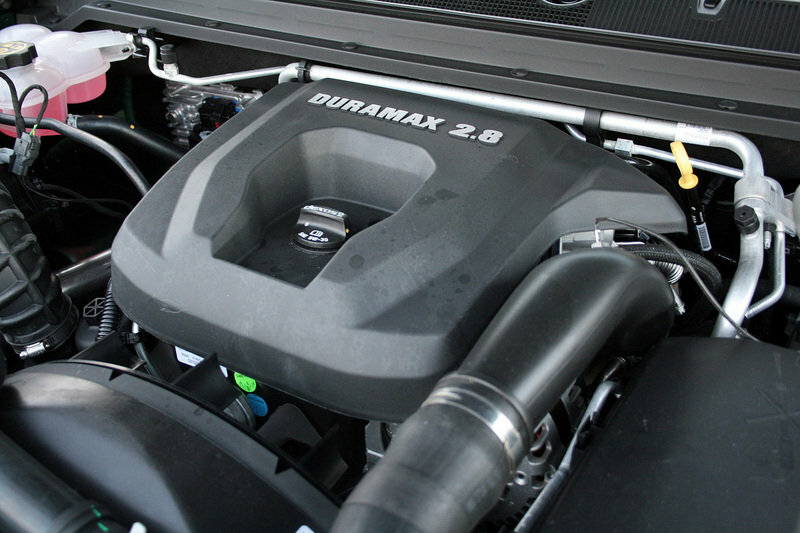 Of course, the big deal for 2016 is the availability of the 2.8-liter Duramax four-cylinder turbodiesel. It joins the base 2.5-liter four-cylinder and the volume-leading 3.6-liter V-6 gasoline engines. Having driven several examples of the V-6, the extra torque from the Duramax is clearly apparent. The engine lays down a respectable 181 horsepower and 369 pound-feet of torque. That’s 100 pound-feet more than the V-6. Those towing or hauling will love the diesel exhaust brake included within the Tow/Haul mode. Flip the switch, and the transmission holds gears longer, downshifts sooner, and uses the engine to slow the truck. Included with the Duramax engine option is an electronic trailer brake that ties in with the ABS system. Those towing or hauling will love the diesel exhaust brake included within the Tow/Haul mode. The engine is mated to GM’s 6L50 six-speed automatic transmission, the same gearbox used with the gasoline V-6. The transmission allows for fully automatic shifting or manually selected gears via a rocker switch on the shift lever. 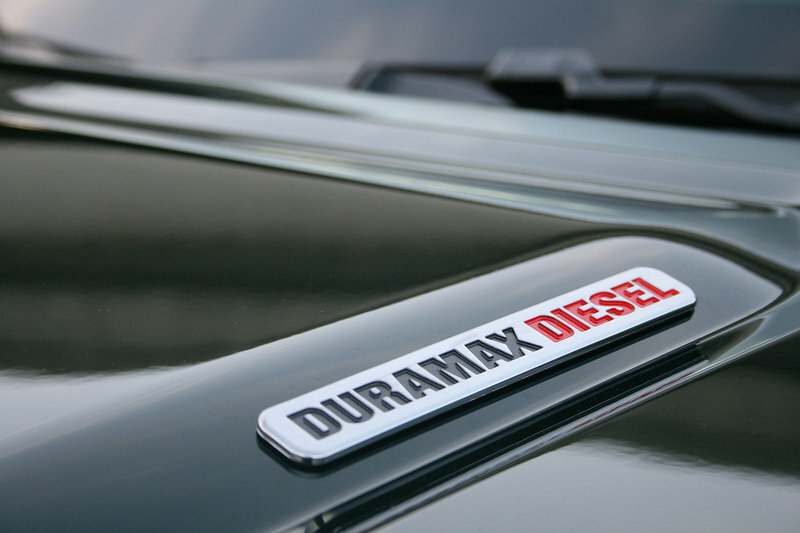 The Duramax started life as a VM Motori-based engine similar to the one found in the Jeep Liberty SUV between 2005 and 2006. GM spent four years getting the diesel to meet the U.S. EPA’s strict air quality standards while making it more refined for discerning U.S. buyers. The engine features an aluminum alloy cylinder head bolted to a cast-iron block, along with several noise-reducing measures to keep diesel knock at a minimum. Included is an engine cover loaded with sound insulation, a metal timing belt cover, a steel plate at the bottom of the aluminum oil pan, and a specific firing program for the high-pressure fuel injectors. Vibrations are kept to a minimum as well, thanks to upgraded hydraulic engine mounts, and a centrifugal pendulum vibration absorber in the torque converter. Keeping the Duramax running clean is an extensive exhaust system. Once the exhaust gasses leave the variable-geometry turbo, they enter a diesel oxidation catalyst before being sent to a selective catalytic reduction catalyst. The final step is the diesel particulate filter. 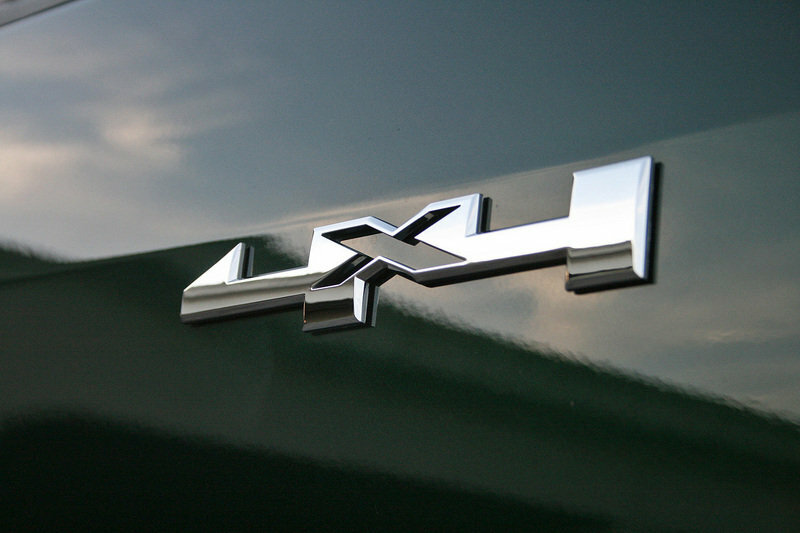 Thanks to the three-part exhaust system, the Duramax needs no muffler. The scrubbed exhaust then exits through the large tailpipe. Mated behind the 6L50 is GM’s electronically operated, two-speed transfer case, enabling 4WD. The rotary control dial left of the steering wheel allows for 2WD, AUTO, 4WD High range, and 4WD Low range modes. The rear axle includes 3.42 gears within the Eaton G80 automatic locking differential. And of course, there’s the topic of fuel economy. The EPA rates my Crew Cab, 4WD tester at 20 mpg city, 29 mpg highway, and 23 mpg combined. That’s not bad at all. During my week with the truck, which included some heavy towing and full throttle test runs, I averaged 22.6 mpg. That’s hard to complain about for a truck, let alone one that’s been doing work. The Canyon Duramax couldn’t have arrived at a more perfect time. Your scribe found himself in the midst of moving, with some 30 miles of various road types lying in between. Hooking the Canyon to the rented box trailer was simple: the backup camera provided an unobstructed view of the hitch ball and the lot attendant did all the dirty work. With the safety chains and wiring connected, and the turn wheel screwed down tight, we were ready to go. Loaded with appliances, furniture, and the eclectic crap one collects over the years, the trailer had to be heavy. I’m dead sure it weighed less than the Canyon’s 7,600-pound max tow rating, but it wasn’t light, either. Slipping the transmission in to drive and clicking the Tow/Haul button, I pulled out of the driveway. First gear held longer, followed by a quick shift to second and then soon third. The Duramax wasn’t even trying, barely idling past 1,800 rpm. Lugging the trailer up an interstate on-ramp with heavy throttle results in 3,000 rpm of diesel fury. Braking with the loaded trailer is an easy task thanks to the diesel exhaust brake. With Tow/Haul engaged, a tap of the brakes endues a downshift and the engine does the rest. It’s nowhere near as violent as an 18-wheeler’s Jake Brake, but it does the same thing. When more braking is needed, four-wheel disc brakes do the job just fine. Lugging the trailer up an interstate on-ramp with heavy throttle results in 3,000 rpm of diesel fury. It’s by no means fast, but the truck never ran out of steam. Maintaining highway speeds was no issue either. Ride wise, the tough weight helped smooth out bumps that would have otherwise felt more jarring. It’s not that the Canyon rides rough, but loaded down, it rides like a sedan. Unladen, the Canyon Duramax is a pleasure to drive. The spring to 60 mph takes roughly 10 seconds, though doesn’t’ feel nearly as slow. In fact, the Duramax feels just as peppy as the gasoline V-6. That’s thanks to the abundant torque and low-ish 3.42 gearing. Steering feels decently weighted, but is somewhat numb. The transmission shifts with authority, though never too harshly. Likewise, body motions are mostly kept in check, but understeer and lean result from cornering with excess speed. Hey, it’s a truck, after all. Surprisingly, the rear end and its traditional leaf springs are decently composed over rough ground and it never felt like wanted to dance sideways. It’s clear GM did its homework when fine tuning the Canyon. While the 2016 GMC Canyon’s base price starts at $21,880 on Extended Cab models, the Duramax is only offered with the Crew Cab. 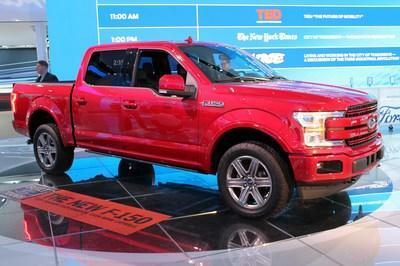 That pushes the base price of the truck to $36,520, including the extra cost for the engine. Opting for 4WD increases the price to $40,435 – at least according to GMC’s “build your own” online configurator. The Monroney included with my tester shows a starting price of $37,450. 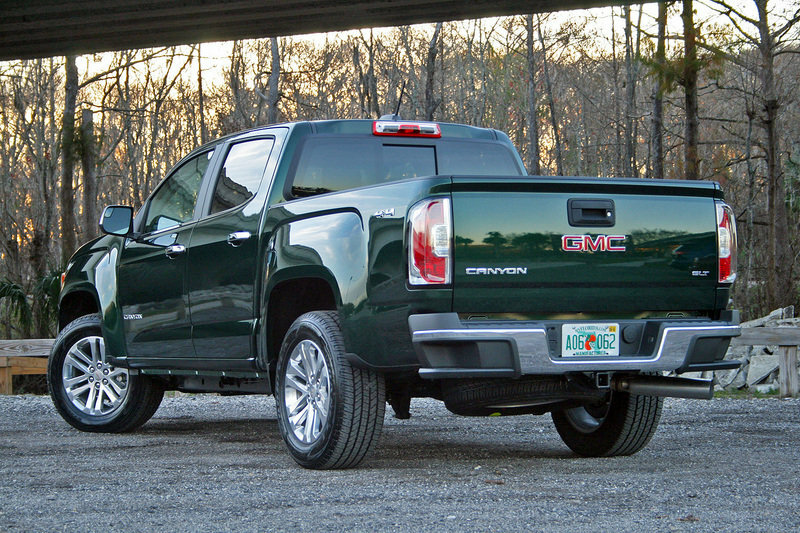 Here are the options: 2.8-liter Duramax ($3,730), Premium Bose audio ($500), eight-inch touchscreen with navigation ($495), spray-on bed liner ($475), Emerald Green paint ($395), and the Driver Alert package with Forward Collision Alert and Lane Departure Warning ($395). The total price for my tester comes in at $44,365 after a $925 destination and delivery fee. The Tacoma underwent a thorough transformation for the 2016 model year, getting nearly every nut and bolt replaced by upgraded parts. Though the truck isn’t completely new, you’d have to be a Toyota engineer to spot the carry-over bits. A smart yet sporty exterior is complemented by an attractive interior. Toyota’s Entune infotainment software offers technophiles something, while the off-roading set will enjoy the optional TRD Off-Road package with its electronically locking rear differential. Of course, 4WD with both high- and low-range gears is available. Powering the majority of Tacomas is Toyota’s new 3.5-liter V-6. The all-aluminum engine features direct injection, variable valve timing, and variable combustion sequences, switching between the Atkinson cycle for conservative driving and the Otto cycle when extra power is needed. Prices for the Tacoma start at $23,300, though the base price for the V-6 starts at around $29,535. 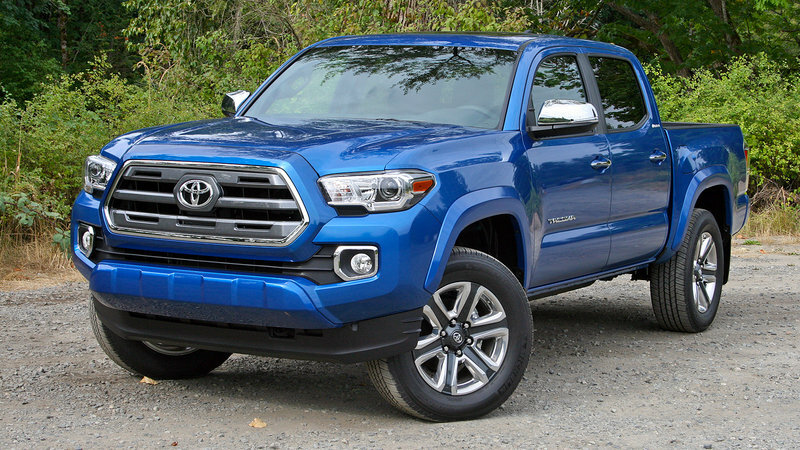 Thought the Tacoma does not offer a diesel option, a comparatively luxurious Taco is priced around $40,000. Read our full review on the Toyota Tacoma here. So you really want a light-duty diesel truck, huh? 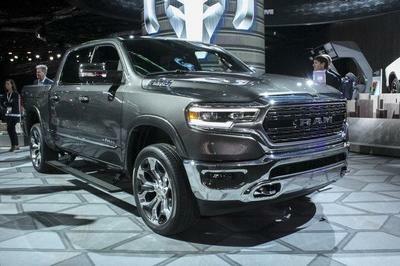 Well, the Ram 1500 equipped with the EcoDiesel V-6 is the only other offering in the U.S. market. Save for the engine, the truck is identical to the standard Ram 1500. It uses a segment-exclusive five-link coil suspension with a live axle in the rear, providing a smoother ride than traditional leaf springs. The minor trade-off is a reduction in payload and towing capacities. Still, the Ram 1500 EcoDiesel can lug a 7,950-pound trailer around or 1,510 pounds of cargo. The engine itself is actually a cousin to the 2.8-liter Duramax – both hail from VM Motori. The 3.0-liter V-6 is its own engine, though and provides the Ram with an impressive 240 horsepower and 420 pound-feet of torque. More impressive is the Ram’s fuel economy. 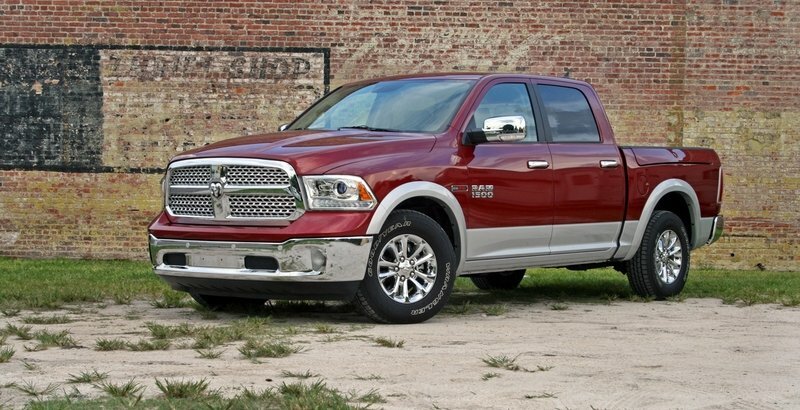 Fitted with the HFE package, the Ram 1500 EcoDiesel is rated by the EPA to get 21 mpg city and 29 mpg highway. Prices for the Ram 1500 EcoDiesel start around $35,000 for a base model Tradesman with the Quad Cab in 2WD. Decked out in its Laramie trim with a Crew Cab, a 2WD Ram 1500 EcoDiesel carries a price of $46,000. Read our full review on the Ram 1500 EcoDiesel here. The 2016 GMC Canyon with the Duramax turbodiesel option is a sweet truck. The diesel simply takes a great truck and makes it better. The low-end torque matched with a competent transmission and 3.42 gearing means it never struggles for acceleration. Granted, it’s no Camaro or Corvette, but the truck feels plenty powerful for its size and purpose. 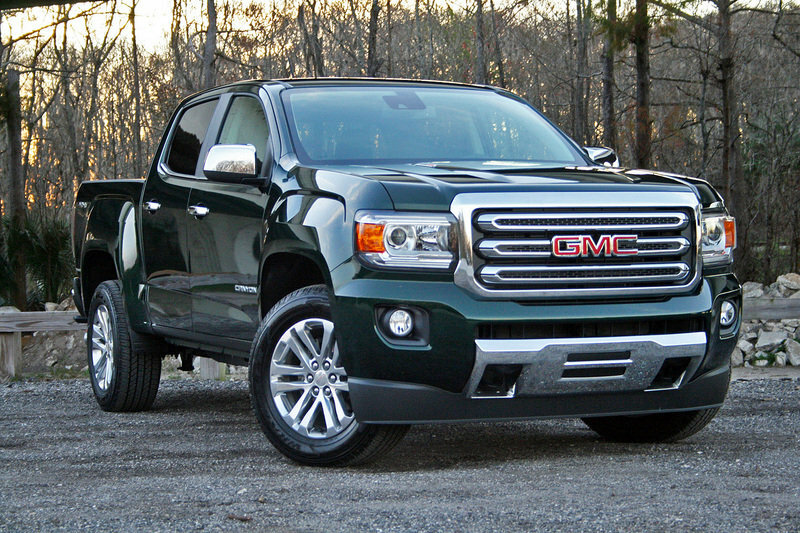 Beyond the diesel aspect, the Canyon remains a top contender in the midsize segment. Sure, the competition is scarce, but if rumors hold true, the Canyon and its Chevy twin should be expecting company. 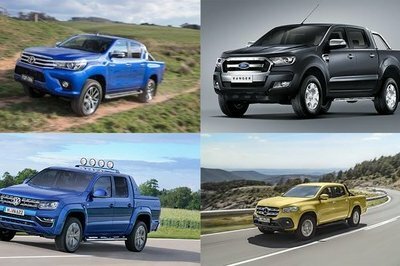 At the time of this writing, Ford is rumored to be toying with a Ranger revival, Nissan is reworking the Frontier, Honda has the updated Ridgeline, and even Hyundai is readying a midsize contender. 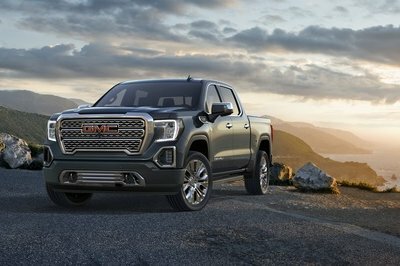 While the Canyon Duramax will likely remain the hardiest and most capable of this bunch, the car-buying public will certainly have more choices. 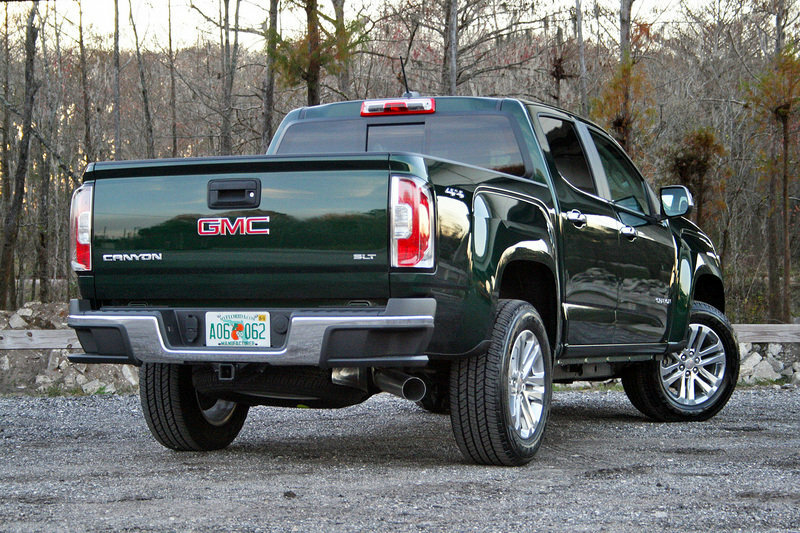 Regardless of the number of contenders, its seems GM is in a great place with the Canyon and Colorado midsize trucks. They offer most of the capabilities of a full-size truck without the negative trade-offs. The Canyon is easy to park, it fits in a normal garage, and in diesel form, is thrifty with fuel – all while providing 7,000+ pounds of towing capacity and the available off-road tech truck buyers crave.